Key players in biogas project development, finance and policy will meet in London at Europe’s must attend biogas meeting to examine growth strategies, investment opportunities and technological advances in biogas production. With over 20 producers already confirmed to attend, this event will provide an excellent platform for knowledge transfer and for setting up new business deals. Green Power’s 6th Biogas conference will bring together the key biogas players to discuss the potential biogas has in North America. For 2 days participants will discuss strategies to increase production of on-farm, landfill, waste and wastewater biogas for heating, cogen and transportation. My goodness! The poor British Public are supposedly in danger of being overworked, stressed, and presumably oppressed by the EU's extra work burden involved for them to comply with the proposed additional Biowaste Food Waste Collections. There is no mention of the fact that additional collections would actually provide additional good quality feedstock material for Anaerobic Digestion Plants and thus spur on further adoption of AD and greatly benefit renewable energy production from waste. The EU is considering proposals which could force thousands of extra bin collections on British householders, council leaders will warn. The European Commission recently unveiled a series of ideas for reducing the carbon emissions that are created from people’s leftover food and garden waste. These include measures which would force new targets on councils for collecting so called ‘bio-waste’ and result in extra bin collections for thousands of householders. For the specific proposal on separate collection obligations, see point 5.5.3 on p16. What do you think about these proposals? Is the waste management industry in danger of asking too much of the public? Pune, Mar 21: Samruddhi Jeevan Food India will generate three phase electricity for the farmers and locals of Malthan village in Daund taluka of the district by erecting a biogas generating plant there, in a bid to get over ever-increasing periods of load shedding. Although the state of Karnataka in South India has thriving, affluent cities like Bangalore, most of the rural population are subsistence farmers, growing rice, millet, vegetables and coconuts in the monsoon-watered land. The main fuel for cooking is firewood, which is becoming increasingly scarce and is hugely time consuming to collect. Indoor air pollution as a result of firewood use is responsible for the high incidence of respiratory and eye problems suffered mainly by women and children. In 1993, moved by his own experience of watching his mother cook on an open fire and suffer from itchy eyes and a bad cough, Mr D. Vidya Sagar set up SKG Sangha with the express aim of providing rural women in Karnataka with an alternative energy source to firewood for cooking. After researching available options, Vidya Sagar chose the 'Deenbandu' cow dung based biogas plant as the most reliable and cheapest alternative and, with the help of a bank loan, began building and supplying these plants to rural households. Since 1993 SKG Sangha has installed over 43,000 of these biogas plants, which is the highest number of plants installed by a single organisation, certainly in India and probably in most other parts of the world as well. The project is expected to create a marked difference wherever waste and waste disposal pose a headache to the local bodies, Biotech Director Sajidas said. As a first step, Biotech has called the attention of interested NGOs, engaged in energy-saving movements, to respond to the project. ``We will select one NGO for each panchayat, give them training and help them form the energy club, which will take forward the activities to the public,’’ Sajidas said. The NGOs will be taught by Biotech members how to install bio-gas plants in households and convert waste collected in houses to energy for cooking. The NGOs will be trained in setting up energy lamps in houses and also the maintenance works of the plant. Once trained, the NGOs will form energy clubs and will be allotted a panchayat each for carrying out their activities. ``The project is being undertaken with the subsidies granted by the Union Department for Energy Conservation and will be coordinated by our regional offices in Thiruvananthapuram, Kochi and Kozhikode. Under the project, we plan to start 1,000 energy clubs throughout the State,’’ Saji said. The EU Biogasmax project has for three years implemented cross-analysis, research and innovation developments on biomethane as a vehicle fuel. This conference will give a great focus on the outcomes brought from this major European Commission funded initiative. Biomethane offers a unique opportunity to integrate waste management solutions with the production and use of a clean burning, low carbon transport fuel. This event will bring together expertise on the production, upgrading and distribution of biomethane, management of transport fleets and environmental assessment to make a strong case for the production of biomethane from organic waste, and its use in transport applications. Presentations will include best practice from Sweden, France, Switzerland, Italy and beyond, insights on the gas vehicle market, on the on-coming European Commission policies and vision, expertise in the production, upgrading and distribution of biomethane, and details of assistance available for those considering biomethane projects. The conference also offers the opportunity to participate in study visits to see projects first hand, and to discuss with those having hands-on experience. Above all, the event will represent an excellent opportunity to meet and network with a wide range of stakeholders involved in the production and use of biomethane, both informally and also through our expert panel sessions. Book the dates!and welcome to Sweden at the Biogasmax Conference on Biomethane 7-9 September 2009. 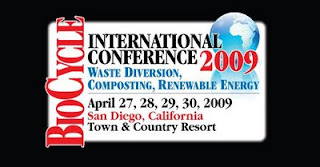 You are invited to join US colleagues at the only conference, which Biocycle informs us, is based on 50 years of industry leadership in every aspect of US composting, organics recycling and renewable energy. The past 50 years of experience “captured in the pages of BioCycle” have provided our generation and those to come with the essential tools and knowledge to recycle organic waste streams back to the soils. You are encouraged to register on-line today – before the conference is closed out due to limited space, and all space may have gone by the time you receive this. With over 70 scientific and practical presentations scheduled on April 28 and 29 (Tuesday and Wednesday), you will not be able to see them all, and will have choices to make. Instructor: Ron Alexander, R. Alexander Associates, Inc.
And on April 30, the conference concludes with an all day field trip to facilities in San Diego.